It’s a fact – budgets fail. It’s happened to the best of us, me included. As soon it happens, your family needs to take immediate action to prevent further damage and inevitably, financial ruin. These four steps to take when your budget fails are the perfect place to start and will ensure that you are staying on top of things the best that you can. I think of this quote, “You may not be able to control every situation and its outcome, but you can control your attitude and how you deal with it”. 1. Stop All Spending. As soon as you realize that you’re off track, stop all spending right then and there. If you continue to spend money, you may be spending money that you don’t actually have. Your spending freeze won’t last for long and you’ll be protecting yourself from anymore damage. Remember needs vs. wants! 2. Assess the Situation. You can’t fix your finances if you don’t know how bad the damage is. Take a look at your bank accounts and their balances and what expenses you still have coming out for the month. This step will give you a much clearer picture. Not knowing where you stand can be more damaging than actually being off budget. It may be painful, but you must do it! 3. Rework the Numbers. If you’re off budget, then obviously your numbers failed. Start by re-doing them for the current month with what you have left. Make sure that you don’t over budget by using your old numbers. You may not have as much of your income left and may have more expenses remaining than you realize. 4. Monitor closely. After you start your path on your “new” budget, pay attention to it more carefully than you normally would. If you went off budget in the first place, something had to have happened to set you on the wrong path. Keep an eye out for that one thing that could set you spiraling again. Getting off budget happens to everyone once in a while. If you find that your family has it happening more often than not, you might need to take a look at the style of budget you’re using. Budgets aren’t one size fit all so if your current one isn’t working, try something else. Keep playing with it and trying new things until you find one that works well for you. 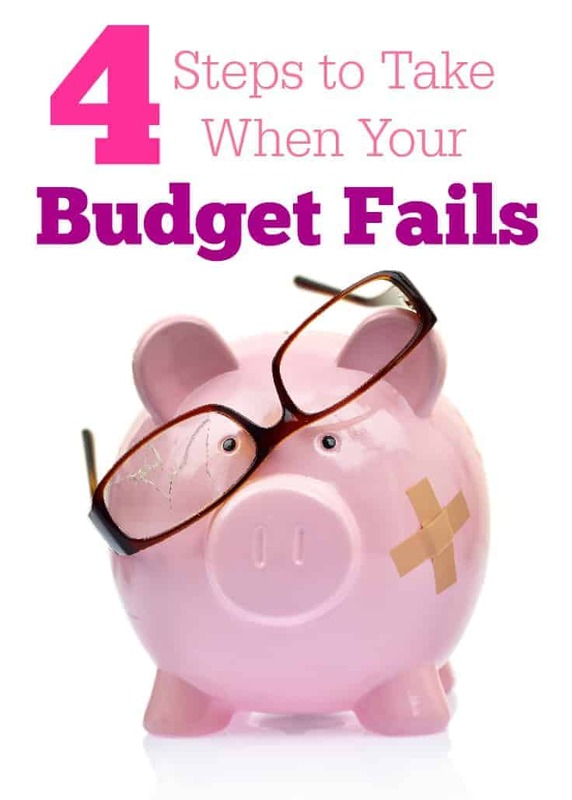 Have you ever had a budget fail? It’s amazing where money goes to and if you don’t keep track of it you can run into debt really quickly – and that takes a long time to conquer. I think the most important is to access that way you don’t make the same mistake again. I used to have budgeting problems all the time; it was rather depressing being constantly stressed out. Part of the problem was that I was a student with a lot of debt. I found that stopping my spending and assessing my situation helped a lot. Constantly auditing and being aware of where my money was going was the best thing. This has certainly happened to me before and being on a tight budget it can hurt. These are great steps to “stop the bleeding”, regain your footing, and make sure you’re back on track for the next month.